Primary Slide (t-track) fits in a standard 3/4" x 3/8" table slot. Uses common 1/4" hex head bolts washers. Anodized finish for low sliding friction. Used to make a table slot mortiser as shown in Fine Woodworking's Annual "Tools & Shops" issue. Anodized Slide Insert for Standard 1/4" Hardware. 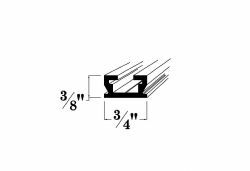 Fits in Standard miter gauge channels. Select a Length 96 in. 48 in. 32 in. 24 in.